"This recipe is a staple in our Maui home. It disappears so fast, you may want to double it. I have made this with pineapple, papaya, and mango. It is very good with a little bit of finely chopped star fruit added if you have one around. Depending on ripeness of fruit and heat of pepper, I adjust to my personal preference." 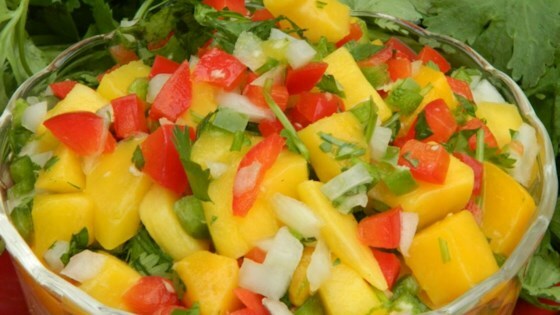 Stir mango, onion, bell pepper, cilantro, lime juice, jalapeno pepper, lime zest, and ginger in a bowl; cover and chill for 8 hours to overnight. Watch how to make this sweet, spicy salsa. Love this salsa. Adding a little fresh pineapple to the mixture really works well. We enjoy this with grilled fish. Made day before party. It was fabulous. Tried it with a little pineapple added, also...that was great too! Can't wait for more mangoes to ripen so I can make more! Awesome, added fresh pineapple. Great on salmon, also on whole wheat chips.